First, let me say Thank You! so much for the comments you left on the Cropped Cargo Pants post! All of you ladies made my day and are so uplifting and encouraging. Thank You! 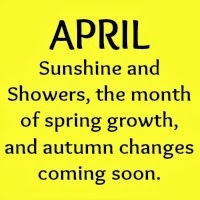 ...SarahLiz, who's a great organizer for our group, has given us an April theme to work with. We have international participants, so some of us are entering warmer weather, and some of us are entering cooler weather. So, for April's challenge, I'm choosing a beautiful, soft knit that I purchased from Joann's last year, to make into a 3/4 length sleeve top from Simplicity 1916. The fabric photographed beautifully, below, not so the pattern. I'll be making view D. Even though it's officially Spring in the South, South Carolina's weather can be all over the place this time of year - well, especially THIS year it seems, so a knit, 3/4 length sleeve top in such pretty colors would be perfect. View D is a cross-over V neck with a 'baby-doll' type front with 3/4 sleeves. This looks like it'd be really comfortable to wear, but I haven't worn a 'baby-doll' type top since Junior High?! Usually I lean more towards fitted tops, but with sewing my own garments now, I find I'm branching out and trying new-to-me styles to wear. Only choosing one item to 'officially' plan to make for the March 2014 MAGAM challenge worked well for me, as I actually made 3 garments during that month AND completed the March challenge in the month of March, so I'm sticking with my 'backwards psychology' and only 'officially' plan to make this cute top for April, with the hopes I'll actually complete more! Looking forward to seeing what everyone is making in April! Thank you Jessica! You Too! I do the backward psychology bit as well - I privately stretch myself, but make sure I do achieve a minimum goal. This knit is so pretty, I look forward to seeing it made up. It's an odd form of motivation, but funny how it seems to work?! At least for us?! Thanks Sarah Liz!